1.2.2.3 The final required tube plate diameter. 1.2.11.1 Generally shell thickness will be taken as follows as (in mm). The object of evaporation may be to concentrate a solution containing the desired product or to recover the solvent. Sometimes both may be accomplished. Evaporator design consists of three principal elements: heat transfer, vapor-liquid separation, and efficient utilization of energy. In our sugar industry the solvent is juice, heat is supplied by condensing steam, and the heat is transferred by indirect heat transfer across metallic surfaces. Robert type natural circulation evaporator. The first three type of evaporators are used in Sugar Industries and recently also use the plate type evaporator. 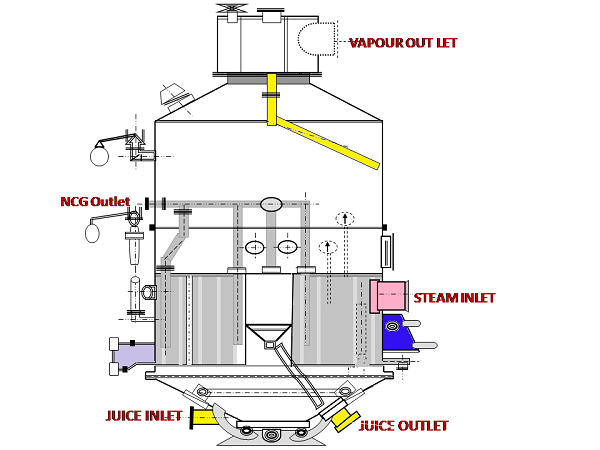 In this article mainly discussed about Robert type evaporator body design criteria. Mean dia of the tube ( Dm) in mtr = Tube OD- Tube Thickness ( In some designers also take ID of the tube in the place of mean dia. Number of tubes = Heating surface / π x Dm x L.
The thickness of the tube generally take for juice heaters and for evaporator 18G and for pans take 16G. ( 18g = 1.22mm , 16g = 1.625mm, 14g = 1.8mm). proportional factor(β) = Generally β value taken for multiple pass(i.e Juice heaters) 0.6 to 0.8 and for single pass(l.e evaporators) 8 to 1.0. Take extra dia in percentage on area occupied for tubes in tube plate for stay roads arrangement, free withdrawal of condensate and noxious gases removal purpose. while providing the multiple down design than this percentage may go higher side. Its value lies in the range 10 to 20% on area occupied for tubes. The central well or peripheral downtake is often utilized to collect the concentrated juice in order to remove it from one vessel to the following vessel. According to peter rein down take dia consider less than 25% of the tube plate dia. According to E. Hugot The diameter of the centre well varies from ¼ to ⅛ of the interior diameter of the vessel. Certain manufacturers replace the centre well by a lateral well or by a series of down takes of small diameter distributed over the calendria (Multiple downtakes). From the above generally downtake dia take 20% on tube plate. Dia of the single downtake = Tube plate dia for tubes x % of downtake on tube plate. Dia of the central downtake in multiple down takes design = SQRT [(Area of the single downtake – Total area of peripheral down takes) x 4/π )] . The final required tube plate diameter. Final Dia of the tube plate = = SQRT [(Area of the Tube plate for tubes + Downtake area) x 4/π )] . Number of steam/ vapour entries will take according to heating surface of the body, diameter of the body and performance of evaporation. Vapour required for calendria = Heating surface x Evaporation rate of the body. Area required for the each vapour entry (m2) = Volume of the vapour in each (M3/sec) / Velocity of vapour. Height of the steam entry = Take Effective Length of the tube. Width of the steam entry = Area for the inlet vapour / Height of the steam entry. Dia of calendria at the point of radial steam entry = Final Dia of the tube plate + Width of the steam entry. (Note : This dia to be maintained at the vapour entry side later it may reduced in vapour travel direction.). Vapour volume outlet vapour in M3/sec = Heating surface X Evap. Rate x Specific volume of outlet vapour/3600. Number of condensate withdrawal points = Consider minimum two numbers of withdrawal points and it can be increase according to the diameter of the body. Volume of the condensate in M3/sec = [Heating surface X Evap. Rate ] / [ Density of water x 3600]. Dia of the each condensate line = SQRT (Volume of the condensate each./(0.785 x velocity of condensate)). Generally 10 m2 heating surface area required 1cm2 area for removal of noncondensable gases. Generally for Robert type bodies will take for lost effect 2.5 times on calendria tube height and for remaining bodies will take 2 times on Calendria tube height. Tromp quotes an American view that the height of the cylindrical body, above the calandria, should be 1.5 times to twice the length of the tubes. It is wise to specify at least twice; moreover, Tromp later recommended 2 In Europe, a minimum of 3.6 – 4.0m is adopted. 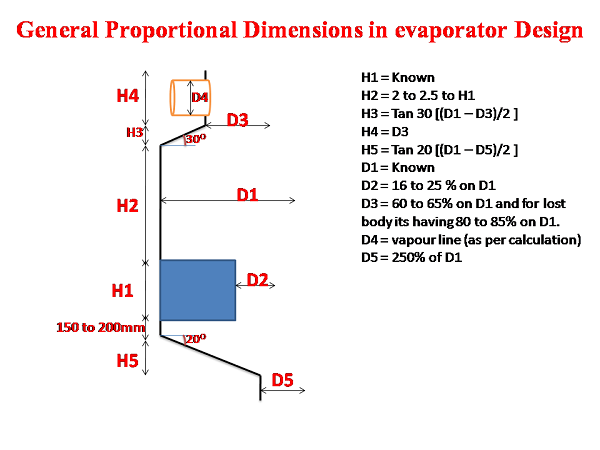 Generally in evaporator design vapour space dia may be take same as to calendria dia meter. But we have to check, how much vapour velocity maintained in body. It is helpful to avoid the entertainment of the system. The velocity of vapour leaving the liquid surface would then be approximately 10 cm/sec. In present designs, The vapour velocities in the vessels to be maintained below 3.6m/sec and for lost body it can go upto 4.6 m/sec . Hence the necessity of providing entrainment separators or save all at the vapour outlets from the evaporator vessels. In any case, it is considered that entrainment rapidly becomes excessive from the moment when the vapour velocity in the vessel reaches more than 6m/sec. Generally shell thickness will be taken as follows as (in mm). Generally for Robert type bodies vapour doom dia taken 2 to 2.5 times for vapour outlet pipe area. Cross sectional area of the vapour doom = 2 x vapour outlet pipe area. Vapour doom dia = SQRT (area of the vapour doom x 4/π ). Top cone angle (φ) = generally take 30 to 35 deg. Condensate Receiving Tank Design Calculation | Condensate Mound. – www.sugarprocesstech.com/condensate-receiving-tank/. Raw juice temperature raised upto 70 to 75oC is the 1st step in Sugar processing. Here I would like to express, it is very useful information for those who work with it. Sugar industries using formula to calculate heat transfer coefficient of a evaporator is= ( Evaporation coefficient x Latent heat of steam or vapour)/ Temperature difference. I am not sure about this calculation. According to chemical engineering Overall Heat transfer coefficient is a function of flow geometry, fluid properties and material composition of evaporator. Heat transfer taken place by conduction , convection and radiation. I want to know that you have done any calculation by considering above mentioned factors to calculate Overall heat transfer coefficient of a evaporator. According to chemical engineering formula as your mentioned process is absolutely correct sir. But in sugar industry generally following the above mentioned formula for simplification of the calculation. Please refer “HANDBOOK OF CANE SUGAR ENGINEERING” By E. HUGOT. Very Useful Data in Sugar industry. What is optimum liquid level in tubes of evaporator?